What a beautiful Spring time we are having in South Texas. The trees are so pretty full of beautiful green leaves. It is amazing how fast they bloom. We are in another rain pattern the next 3 days. No complaints as we need the rain. I have finished the applique for the Medallion for Enduring Legacy and 2 Star Blocks (4 1/2″). I have 10 more 4 1/2″ Stars to make to complete the Center Medallion. I am really enjoying this project. Have a great day – we are getting out today – going to iHOP for breakfast. I can eat eggs, but not much of anything else because I am a Celiac and cannot eat all the goodies at other Restaurants. So this will be a great treat for me – NO COOKING. Then we will be going to a couple of Quilt Stores in San Antonio. Just to get out will be wonderful. Hubby is doing great and hopefully he will be able to take the hard neck brace off at night. We see the doctor tomorrow. We are also making plans for our annual trek to Sierra Vista, AZ this winter! YEA! I am soooooo ready. It is so nice to get in that 36 foot Fifth Wheel and travel – not to mention that it only takes about an hour to clean each week. Laundry is accomplished much quicker. Yes, looking forward to when we pull out and head West for the winter. I would like to go East to the Houston Quilt Show in late October then turn around and head West! Fun Fun Fun! 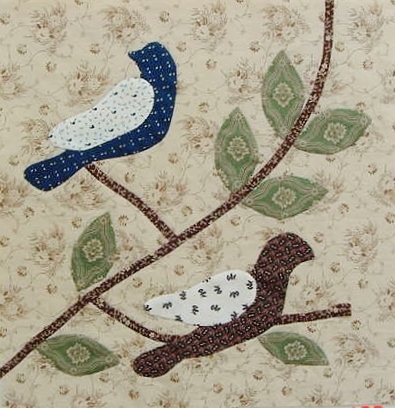 Have a great day and enjoy your quilting projects! ← WOW – April Already!!! 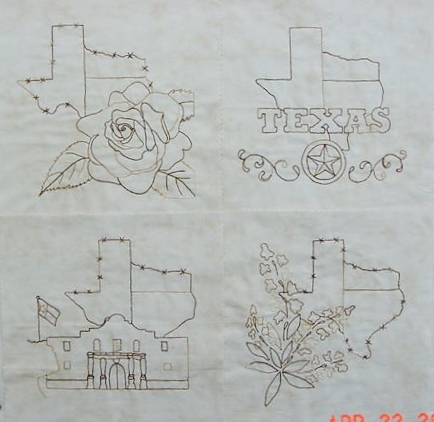 Such a good Texas design. I like the barb wire borders around the state shape. I used to live in Texas. I do like your projects. The applique and the pieced stars are nice. That will be a pretty quilt. I love the embroidery. Those will be very nice when done. Keep up the good work. Your trip this fall sounds wonderful.